In 1901, the family was living in West End, and Harry at 9 years of age was the youngest child of four in the house, the oldest son Frederick having left home: Jane (17), Alice (15), and John (13) completed the family in the household. According to the 1911 census Harry had 5 brothers and sisters: Frederick, Jane, Alice, John, and Samuel Hampton who was recorded as an adopted son. The Book of Remembrance states that Harry worked as a farm labourer prior to going to France, and this is confirmed by Harry's entry in the 1911 census. From surviving documents we can be certain that Harry Carter joined the 4th Battalion, Yorkshire Regiment, a Territorial battalion, on 24th January 1910. 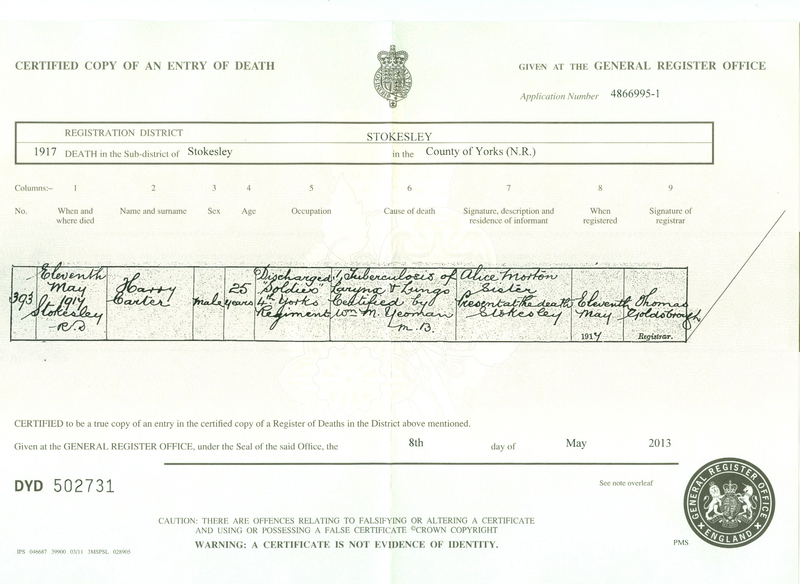 In his attestation (enlistment) papers, he gave his occupation as groom to Mr J. P. Sowerby of High Street, Stokesley (the lawyer who was to become a great benefactor to the town). Harry was then described as 5’ 5 ½" tall, with a chest measurement of 36” expanding to 38”. He had good vision and good physical development. The 4th Yorks Territorial Regiment was in Wales on manoeuvres when war was declared and returned home to await orders. They were mobilised on 4th August 1914 in Northallerton and were sent to France in April 1915. The German army seems at this point to have been better prepared and better equipped than its British counterpart. (The following information about weaponry and fighting is largely drawn from the work of Bill Danby of Skelton, in his website entitled The 1/4th Battalion, Alexandra Princess of Wales' Own Yorkshire Regiment). The Germans had trench mortars, hand and rifle grenades and sniper rifles with telescopic sights. British weaponry by comparison seems to have been somewhat inadequate. The British were for example using improvised hand grenades, such as the “Jam Pot”. The soldiers would have needed a good sense of humour! Amongst all these necessities, gas masks were not included. As far as Harry Carter was concerned, this was to prove a serious omission. 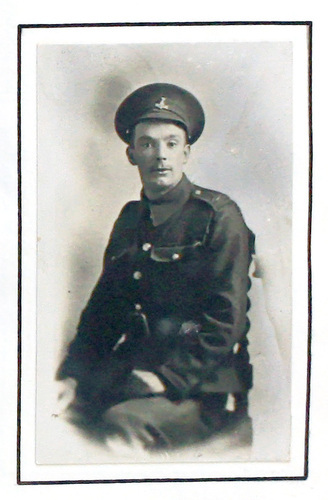 According to the Book of Remembrance Private Carter was with his battalion on Whit Monday, 24th May 1915. On that day at dawn the Germans opened up with artillery, machine guns and rifles. They also released their latest weapon, chlorine gas. Witnesses said the gas formed clouds 40 feet high which drifted on the wind across the British line. The effects of the gas were said to have been felt as far as 20 miles away. 5 officers and 198 Other Ranks fell in the attack.. The Book of Remembrance tells us that Harry was caught in this gas attack and never really recovered. His army records certainly show that he was admitted to hospital several times between May 1915 and his eventual discharge in July 1916. There is no mention in any of these records of the effects of gas, and Private Carter remained in France from 17th April 1915 – 17th June 1916 when he came back to England from Wimereux near Calais on the Hospital Ship Newhaven. On 17th July 1916, Private Carter was discharged from the army as being “no longer physically fit for war service”. Harry’s description was as follows: 24 years 6½ months old, 5’ 8” tall, with hazel eyes and brown hair. His trade was given as miner and his address was West Green, Stokesley. His military character was “very good” and he was “honest and sober”. At this time doctors quite understandably knew little or nothing about the long-term effects of gas attacks, and made no links between such events and subsequent prolonged illness or death. It is at least questionable therefore whether the medical report which accompanied his discharge was a hundred per cent correct in stating that Harry had tubercular laryngitis. The doctor noted that Harry could only speak in a whisper, had a chronic cough and blood was present in his sputum. The doctor further said that Private Carter needed sanatorium treatment and that he was totally incapacitated at that present time. This report was apparently read by the doctor’s superior, who seems to have sent it back with the eminently sensible suggestion that Private Carter’s sputum should be tested to confirm the diagnosis of tuberculosis. The original doctor did not want to comply, and merely wrote: “There is no doubt that he is suffering from TB”. And so Private Carter was discharged; but this simple comment left Harry with a potential problem, as it effectively meant that it could now be argued that his illness was nothing to do with his war service. Harry Carter was indeed sent to a sanatorium - in Aysgarth - but there was no improvement in his condition. Years later, his niece Madge would tell her own children that she could never forget her uncle lying in bed at home with hardly any voice at all. The Book of Remembrance tells us that Private Carter died at home following “long suffering” on 11th May 1917, aged 25. He was given a military funeral in his home town and the Last Post was sounded over his grave. His Death Certificate gave the cause of death as TB, certified by Dr Yeoman. “I am given to understand that there is a Bronze Plaque for each dead soldier. Could I get my son’s – his name and number are as follows No 1041 private Harry Carter 4th Yorks”. The reply she received, stamped 5th February, was potentially devastating. It said that the "bronze plaque and scroll" could only be issued if she submitted medical evidence that Harry’s death "was directly caused by his army service". This was something she had never doubted, but could now perhaps never prove. Jane Carter probably never received the prized plaque, as this is the final communication in Harry's file. Go to next soldier: Clark G.